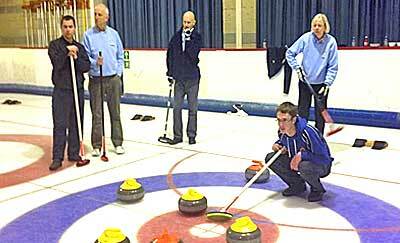 A game of Curling is played by two teams of 4 players who take turns to throw their stones towards the house. The object of the game is to get more stones closer to the centre of the house than the opposing team. Games usually comprise 8 ‘ends’ but there is also a set time to play determined by the rink. A bell indicates the start of a 2 hour session and another bell to indicate the imminent end of a session. It is common to read of games lasting ‘8 ends or the bell’. On occasion skips may decide to end a game early if the scores are such that there is little chance of one team winning the game. It is often a sporting gesture to congratulate a team who are clearly winning the game although in club curling the accumulation of shots and ends makes it well worthwhile continuing to the end! Team leads toss a coin to decide who should start and the first team to play selects their preferred set of stones. Play starts from the hack where stones are delivered towards the house at the opposite end of the rink where the skip stands ‘giving the ice’ to indicate where the stone should be thrown. Players have positions within a team, and the players of each team take two turns to play, alternating with their opposite number and starting with the lead followed by the second and the third. The Skip throws the last two stones. The Skip directs the game by calling the shots for the other team members and until they play their own shots they can be seen standing in the house indicating where the shots ought to be played. Marcus Sticker web site explains basic curling situations by the way of animated practical examples Click here to visit the site and follow the instructions to benefit from this site. The lead player is perhaps not at the glory end of the game however the quality of their shots makes a big difference to how the rest of the end is played. 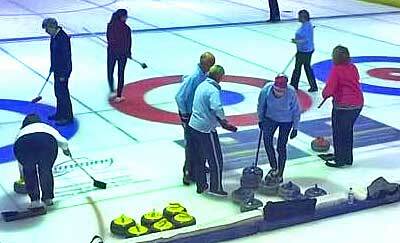 In competitive curling the lead stones are very important indeed. The second player builds on the first and is likely to be required to play behind other stones or ‘take out’ other stones. They must be able to play a variety of shots accurately. The lead and second form a ‘front end’ that has a crucial role in getting the upper hand in any end. The third player has two roles, first they throw stones at an important stage of the end when there are more stones in play and when precise play is necessary to protect or regain a winning position. Secondly they take charge of the house to call the skip stones. The skip has overall responsibility for the team and directs which shots should be played. They have the ultimate task of playing the final stones and securing a win in each end.